TOOLBOX V2. Visual Basic source for a customizable Icon Palette for Windows. Allows for a floating Icon Palette to launch programs. A very nice program to learn from. Source code only. 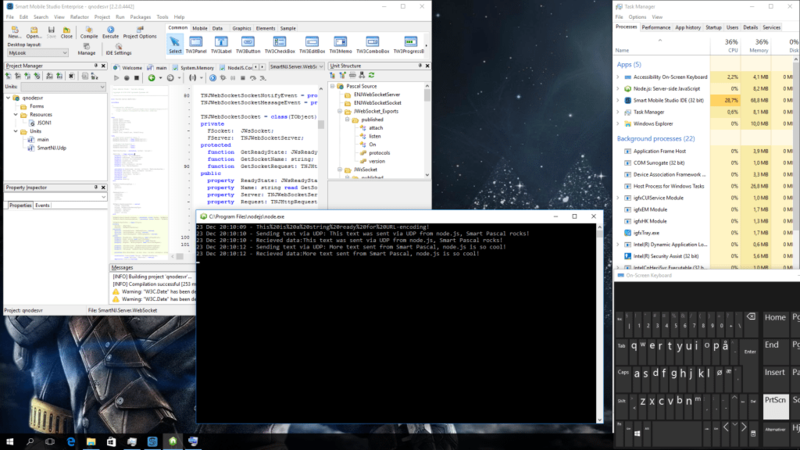 ToolBox is a utility application which I wrote as an exercise in learning to use the Windows API functions from Visual Basic. The purpose of this utility was to provide me with a graphical program launcher which had a smaller Desktop footprint than the Program Manager. The 'form' of this utility appears like a 9-button calculator. An application can be associated with a button and launched when the button is 'pressed' with the left mouse button. A picture, from any .ico file, can be used to provide a graphical representation of the application on the buttonface as a mnemonic. A capability is provided to create additional 9-button sets thru which the user can gain access via the Left and Right buttons in the Box. Between the Left/Right buttons is displayed Available Memory. This application is NOT a Windows Shell which replaces the Program Manager. I start Windows with the PM minimized, just to keep it out of the way. I also wanted the capability to access some menu-type functions, but I didn't want to increase the footprint of the form by displaying a Menu Bar. I finally figured out a method, using the Windows API, to access a menu which is designed with the VB Menu Design Window from a Window Control Box. I have uploaded the VB source to this application as a demonstration of the use of this technique. All of the code relative to using this technique can be found in the ToolBox.frm Form_Load and Form_Unload procedures. Declaration of the API routines that were used can be found in the Global.bas. The declarations were extracted directly from the WINAPI.TXT file which can be found in library of this forum. Take pity on the author and don't judge his true talent from this example, as this application was written for his own amusement and is not polished . The author does welcome any comments, questions, suggestions, insightful coding techniques, criticisms , etc. and can be contacted via this forum. As this IS freeware, support will be provided only as the author feels like it . Though I used this technique to reduce a window footprint, it can be used in other situations as well. Off the top of my head, I could imagine using this technique to create PopUp menus which can be displayed just about anywhere or using this technique in a form with a Menu Bar in order to gain access to application functions when the window is minimized. But I digress. To associate an executable file and an icon with a ToolBox button, use your RIGHT mouse button to click on the ToolBox button with which you want to make the association. A form will be displayed which shows the current properties (initially blank) of the selected ToolBox button. You may enter the appropriate pathnames directly into the textbox or use the Browse feature to locate and select the files. EXIT the Browser and OK the Properties to complete the association. Clicking your LEFT mouse button on an Associated ToolBox button will launch the application. To create another 9-button set in the toolbox, click with your RIGHT mouse button on either of the Left/Right ToolBox buttons at the bottom of the ToolBox window. Respond affirmative to the query in the Dialog Box which pops up and the new set will be created. Previously created sets can be accessed by clicking with the LEFT mouse button on either of the Left/Right buttons at the bottom of the ToolBox. The number of sets which can be created is only limited by system resources. To access a few additional features, select 'Options...' from the Window Control Box. This application will create a file on your hard disk in which the button associations are maintained. In its executable form, ToolBox places this file in the same directory in which the .exe file is located. But, when run from under VB, this file will be placed in the current path (whatever that may be).